In The Only Fly in the World part 2, Skip gives you his first-choice flies to try when you find yourself overly dependent on just one fly. Hook: Heavy wire, 4X long, sizes 12 to 6. Tail: Three or four pheasant-tail fibers. Abdomen: A football-shaped foundation of wool yarn, bound. Over this foundation, dark olive-brown (if you can find it) or dark-olive or dark-brown chenille. Legs: Grizzly dyed dark-green (or substitute dark-olive or dark-brown). Trim off the fibers on the top and underside. Wing Case: A section of pheasant-tail fibers, trimmed across the end. Thorax: The same chenille used for the abdomen (though it can be of smaller diameter). Hook: Heavy wire, 2X or 3X long, sizes 10 to 4. Bead: Black metal, 1/8-inch diameter. Thread: Eight-ought, 6/0, or 3/0 in the wing's color. Tail: Soft fibers from the sides of a marabou plume, mixed with fine mylar strands (Lite Brite, Angel Hair...) in silver and a color close to the wing's color (or purple for a black leech). Collar (optional): A few strands of marabou twisted around the thread, against the rear of the bead. Hook: Heavy wire, 2X or 3X long, sizes 8 to 4. Thread: Green or olive 3/0. 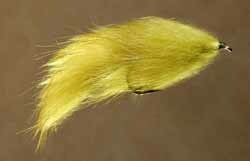 Tail: Soft side-fibers from a dyed-olive marabou plume, mixed with fine green or olive mylar strands. Wing: Soft side-fibers from a dyed-olive marabou plume, bound in four or five bunches up the shank, bare thread between bunches. Beneath each bunch, a few strands of olive or green fine mylar strands. Atop each bunch, a small bunch of black marabou trimmed short. Hook: Heavy wire, 3X or 4X long (straight or slow-curve shank), sizes 10 to 2. Belly: White Buck tail; don't stack the hair. Wing: Brown buck tail (not stacked) over gold Flashabou and Krystal Flash. Hook: Heavy wire, 2X to 4X long, sizes 10 to 2. Thread: Three-ought, in a color to blend with the body's color. Tail: Short Zonker strip with the fur side up, same color as the body. Body: Crosscut rabbit strip wound up the shank in close turns. About any color you'd use for a Woolly Bugger. Comments: A metal bead or cone at the eye is optional. Hook: Heavy wire, 3X to 6X long, sizes 10 to 2. Thread: Brown or dark-olive, for both ends. Body: Gold mylar piping, slipped over the shank and bound at the bend and eye. Tail: the end of the body-mylar and the end of the Zonker strip. 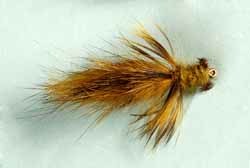 Hackle: Grizzly dyed olive (a hen neck, soft rooster hackle, or big dry-fly hackle). Wing: A dark-olive Zonker strip. Hook: Heavy wire, long shank, sizes 4 to 3/0. Thread: Three-ought in a color to blend with the wing's color. Eyes: Lead or lead-substitute barbell eyes (red, usually, with black pupils). 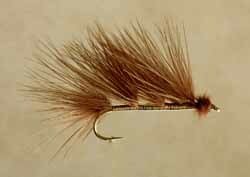 Tail: Eight long saddle hackles in two sets of four, with a few strands of Flashabou along the outside of each set. Beneath the hackles, a small bunch of long buck tail. Body: The butts of the buck tail bound up the shank with crisscrossed turns of thread. Wing: A bunch of long buck tail, usually dark or colored, over light buck tail. For the front body: Almost any hook of appropriate size will function for the front body—a good chance to use up those cheap hooks that wouldn't hold a fish. The hook should have a big eye if you plan to run the backing through it, as Ray advises. Thread: Three-ought of a color to match the color of the fur. Tail: A Zonker strip, black, brown, purple, dark-olive, olive, light-olive—about any color (or shade of olive) you want. Rear Body: A crosscut rabbit strip, same color as the tail. Front Body: A crosscut rabbit strip, same color as the tail. Weight (optional): Lead barbell eyes. Dub around the eyes with fur cut from one of the hide strips. And that concludes The Only Fly in the World Part 2. In part one of The Only Fly in the World, Skip credits the Woolly Bugger as a highly versatile and effective fly; but challenges you to look seriously at some other top flies that can be just as deadly. 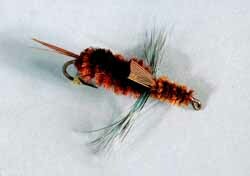 In part three of "The Only Fly in the World", Skip shows you how to tie the Articulated Leech, step by step.